When people know I am interested in Godly Play, they always ask me this question. And you know what? Every time I dodge the question and try to be supportive. I don’t want to discourage ANYONE from using Godly Play! However, I do know that I certainly can’t leave out memorizing the story. I’ve always thought that the words were so important that I had to do my best to get them to the children: I only have about 10-15 minutes of a 45 minute Sunday School class for nine months of the year! When I tell a Godly Play story, I don’t read the story, and I don’t even memorize it. I tell it, from my heart. I enter into the story with all the presence and attention I can bring, knowing that each time I tell this story I will discover something new. (…) Our different life experiences, our different developmental stages and different personalities mean that each of us will tell Godly Play stories in a unique way. Implied in telling is the authenticity of what is being told. The underlying message is that this story matters. It matters because Daddy or Grand-daddy or Uncle Bill knows it all the way through. It matters because Mama or Granny or Aunt Sue loves it enough to know exactly what happens next. Of course, what that also means—and this is the source of the child’s perception of authenticity—is that Daddy and Mama et al. have valued this story enough to know it in detail and have also thought about it before telling it. What telling rather than reading or watching also means, of course, is that the stories of the faith can be pulled out spontaneously when their words and plot lines are apropos of some conversation or situation other than bedtime. So, I memorize the story. That happens on Saturday night, and I must be diligent. On Sunday morning, I tell the story, leaving what comes out up to the Holy Spirit. Alright friends, I am on a mission. This September 15th is the 50th Anniversary of the bombing of the 16th Street Baptist Church here in Birmingham. On that Sunday, at 10:22 am, dynamite planted by white supremacists ripped through the side of the church killing four young girls. 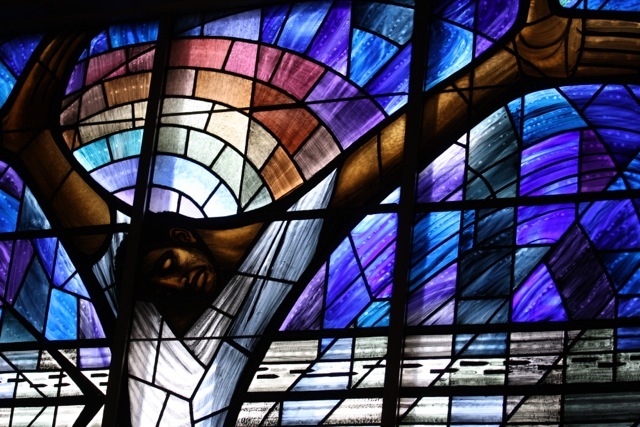 The church lesson planned for that day was “A Love that Forgives.” Check out this link to learn more and get your church to join congregations across the country to share the message of love and forgiveness interrupted on that fateful day. How cool to have church bells across the globe ring at 10:22, marking how far we have come and pledging to continue overcoming hate and oppression! Please read her blog post (full of information, ideas, prayers, and resources) and hear how a teacher workshop she attended in her hometown of Birmingham, Alabama turned into something much, much bigger. Can you please pass this on to use in your church and your friends’ churches everywhere, in the US and “across the globe”? Every church seems to have their own spin on Back to School. We need to print out our prayer list on 8 1/2 x 14 paper (legal size). We didn’t take into account just how many names of students, faculty, and staff both here and far away that our church members want to pencil in – and they like to do it at each grade level! 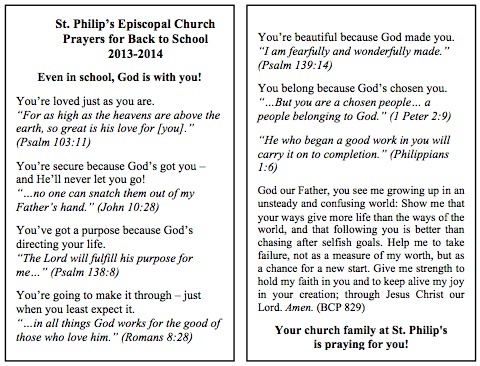 A Prayer Card for each student! Three of us worked on this prayer card. One of us wanted a lovely St. Monica prayer, but it didn’t really fit with our Episcopal tradition. Another thought a prayer from our Book of Common Prayer was plenty (and you can’t go wrong with that). A third proposed writing a collect based on a formula, but we were way too tired for that amount of energy. With the miracle of the internet, our fourth friend helped edit it while traveling halfway across the country on vacation. 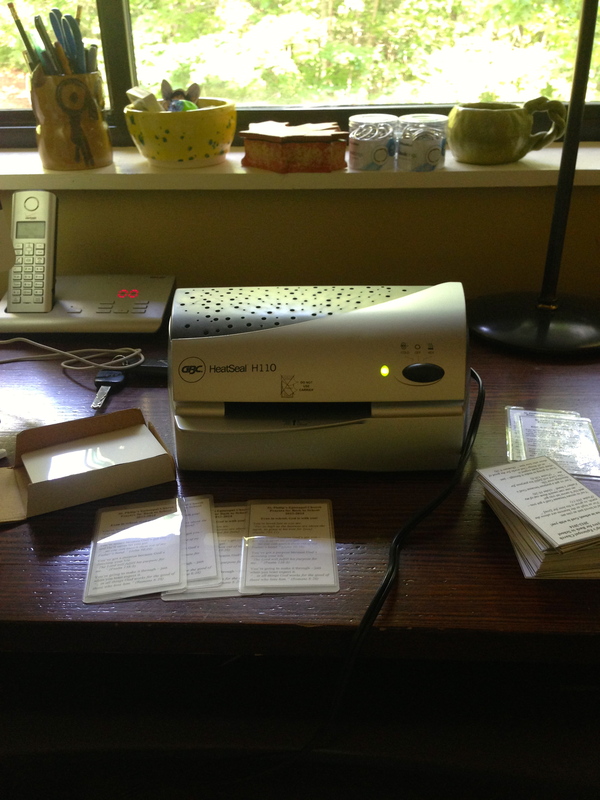 Eventually, we settled on the format below. 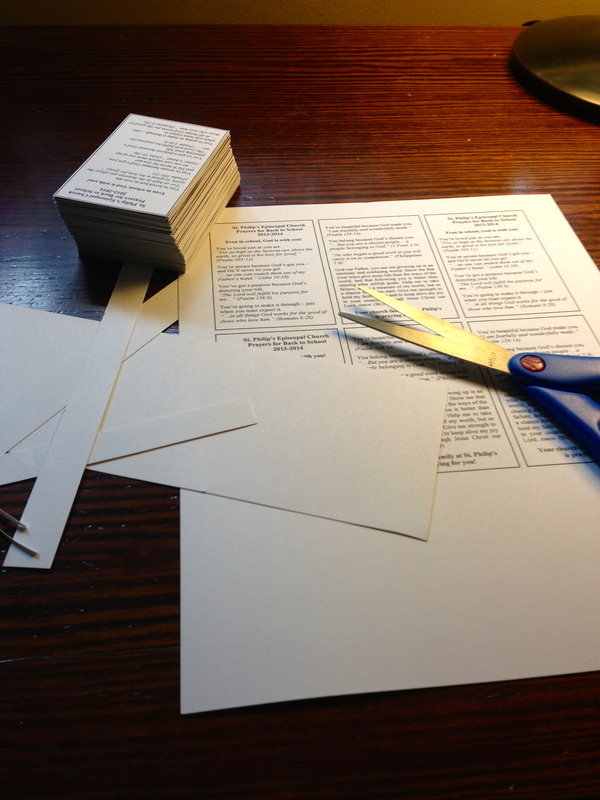 We already have a template for small credit card size cards, so we can laminate them easily. We bought rings from an office supply store so that the card could be clipped in or on a purse or backpack. 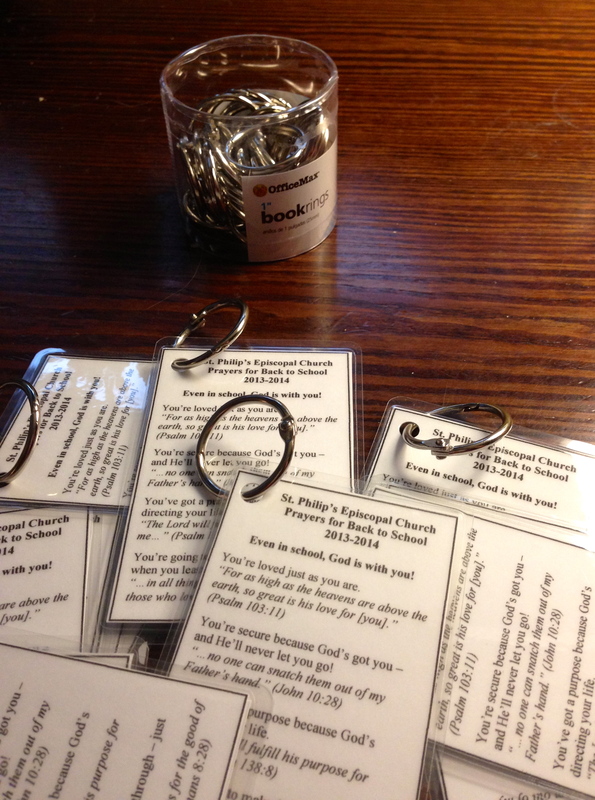 If you’re looking for “Blessing of the Backpacks,” then rush right over to my friend Fran’s blog on the chancel steps and you’ll find a good one! My co-chairman for Sunday School events and I are an ESTJ and an ISTJ (Myers-Briggs). When we plan for our annual Sunday School Recognition each May to close out the Sunday School year, we start planning in May of the previous year! 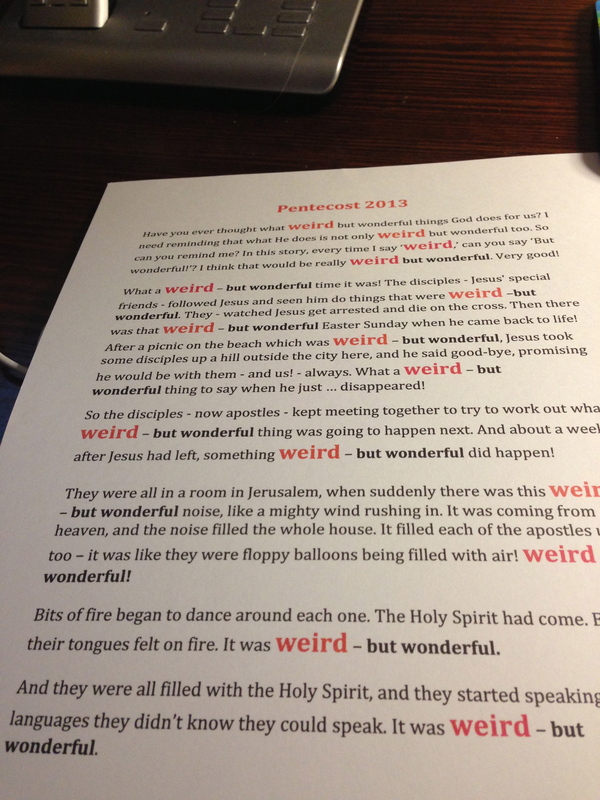 In 2013, our Sunday School Recognition coincided with Pentecost. 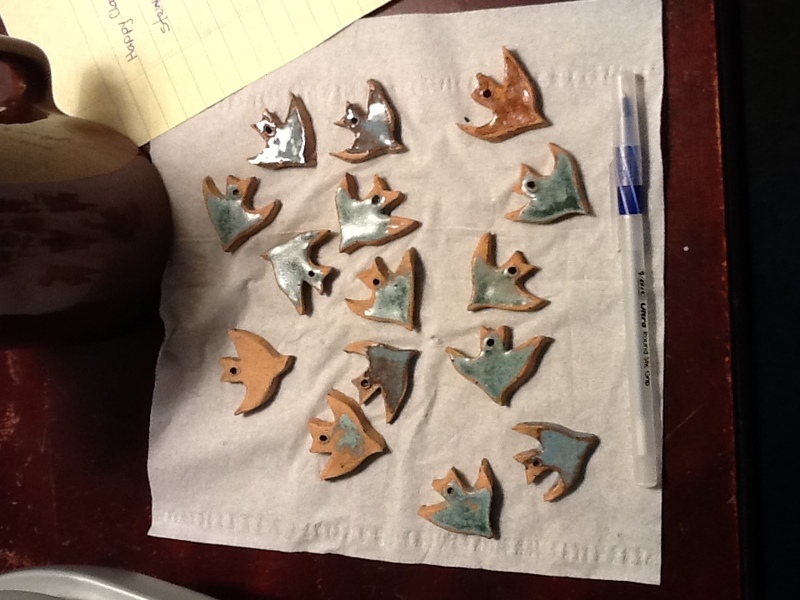 Last summer (in 2012) we “commissioned” a family member to create these simple doves as teacher presents. Check. They were fired, glazed, and put away with a careful note in my nagging software to tell me where I put them. 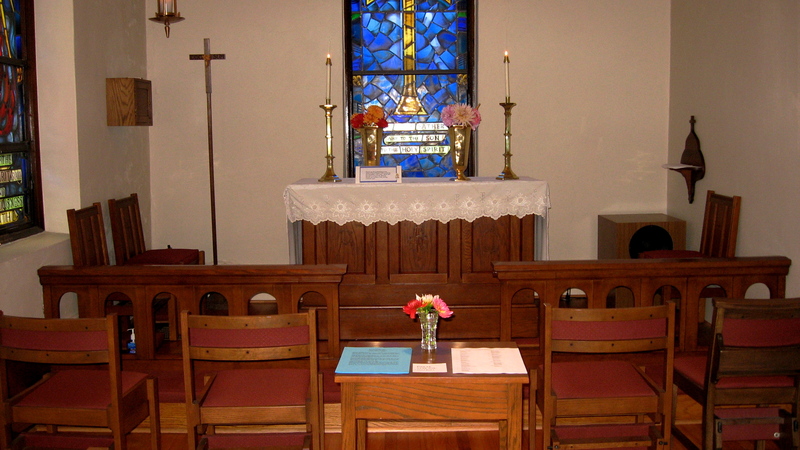 In Lent, we started planning for Pentecost. We ordered dove kite kits that we could repackage for a simple gift for each child. Done. And what would our short program be? We did the Blown-Up Pentecost just last year and it seemed too soon to repeat. 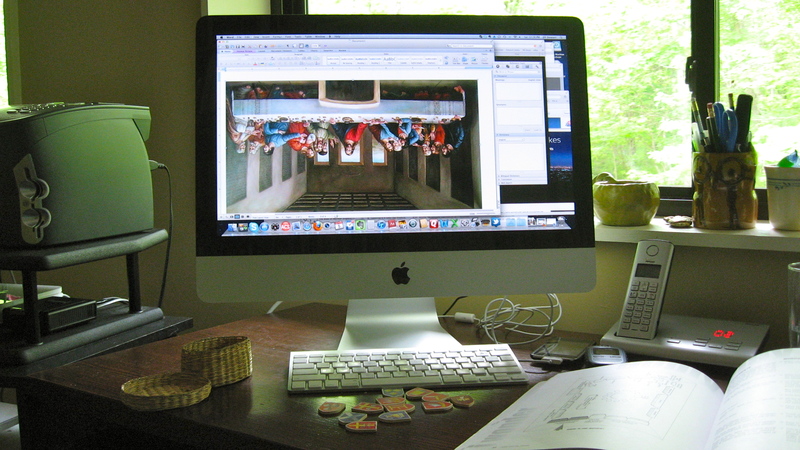 I wanted something interactive – so a kite liturgy that we found online plus kite gifts were just the ticket! Our nursery chairman wanted to give a gift to the “graduating” kindergartners who were aging out of the nursery, so we ordered copies of Alleluia! Amen. (pictured below with mischievous Milo) and they arrived in plenty of time. Done and done! We purchased gift cards at the coffee shop up the street from our church for all teachers, too. 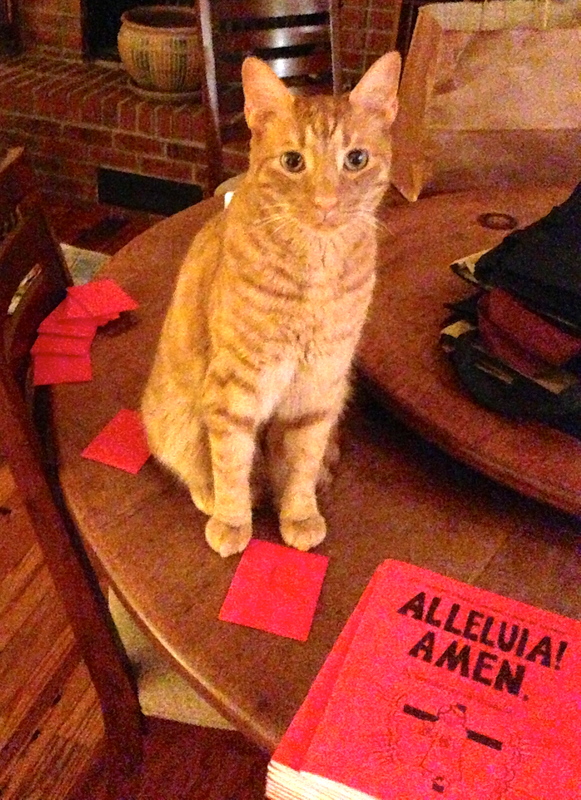 I made red envelopes for them (which mischievous Milo promptly scattered in the picture above). What could go wrong with such meticulous advance planning? And is it going “wrong” if the Holy Spirit gently nudges us along a different path? Well, NO! But we are results driven people and we apparently need more than gentle nudges. I being otherwise overcommitted that Saturday, my fearless friend went out to find appropriate small gifts for the children. 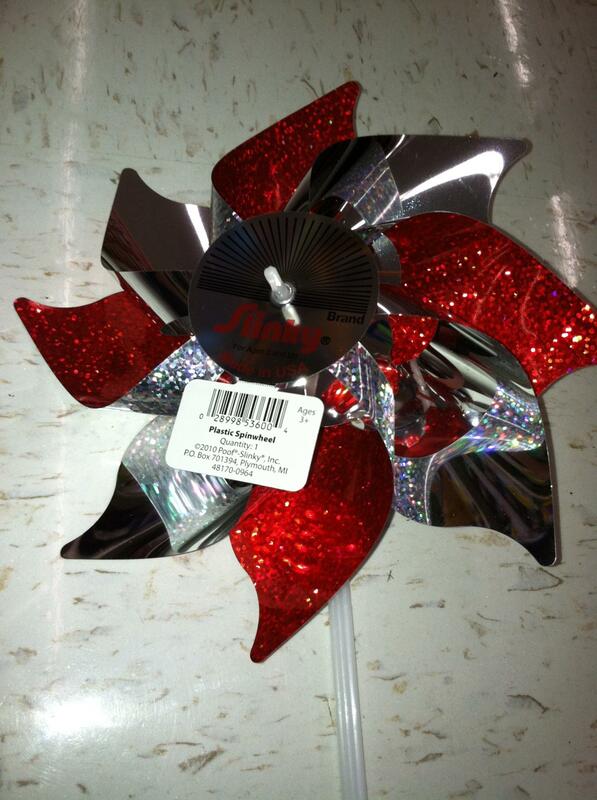 She had seen rainbow kites at the right price at the Dollar Store as well as a few other things; these would fit okay with the kite liturgy. 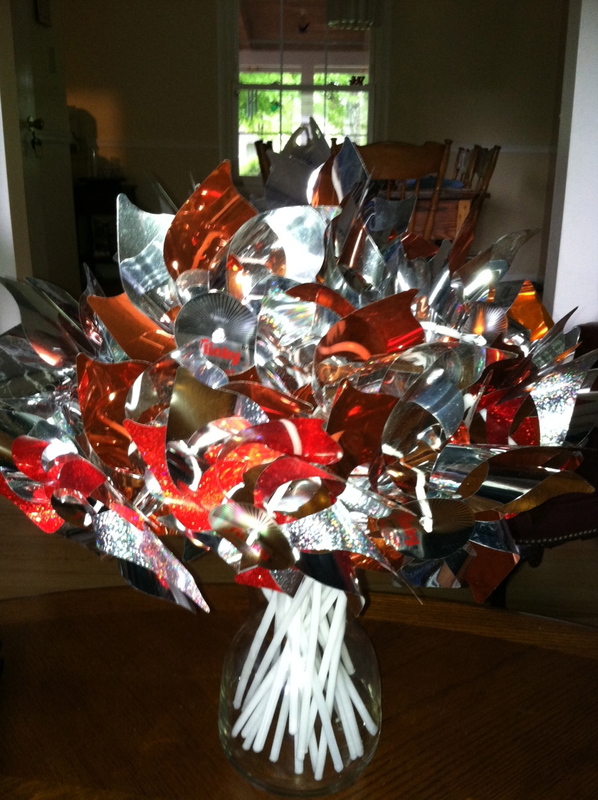 More searching on the internet found this interactive story, which we slightly rewrote to use some Godly Play language – and pinwheels and a mighty wind fit right in! Traditionally, the youth (grades 6-12) receive chocolate for a gift. 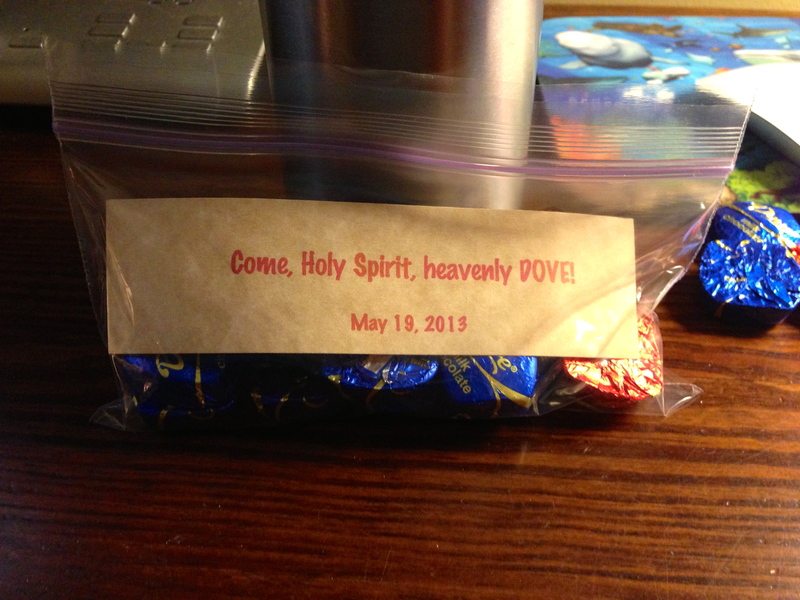 We found Dove chocolates on sale (in keeping with our Pentecost theme) and packaged them up. 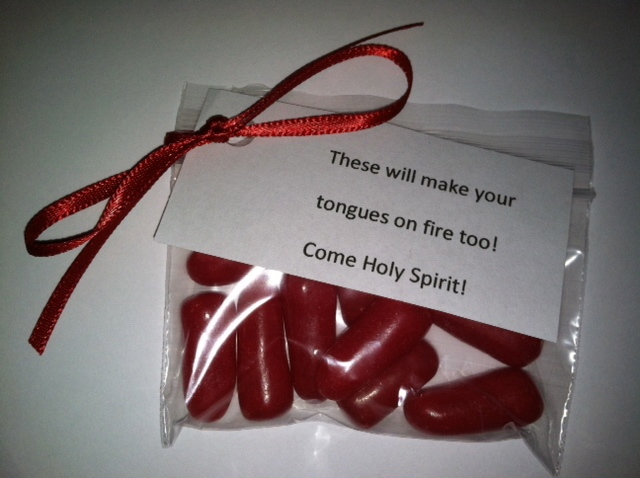 And, we finished up by packaging up a few candies (Hot Tamales) for the younger children, to remind them of the Holy Spirit. 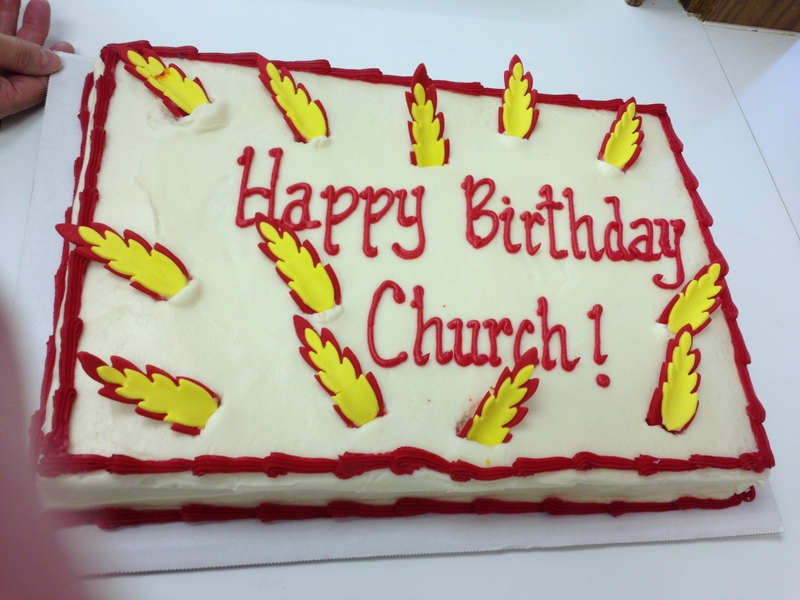 At the close of the program, we sang “Happy Birthday” to the Church and had cake and punch. It was a fun day that ran like clockwork, once we co-chairmen managed to get out of the way of the Holy Spirit! What’s up at our place for Advent 2012? We’re traveling new paths to Bethlehem this year! Our young parents have asked, and we’re trying some new things. We had an evening Advent wreath craft for children in 2011 (you can find the planning and follow through here, here, here, and here). This year, the young families suggested a new path to Bethlehem. On Sunday, December 2, 2012 we’re having an Advent Wreath Workshop after Sunday School and church for anyone who wants to participate (one per family, please!). We’ll provide greenery, candles (we chose 10″ patriot blue and pink tapers from Candles4less.com) and 8 1/2″ oasis rings for the wreath. Instead of our usual fellowship dinner and Advent craft on the first Wednesday in Advent, we’re changing it up to have the dinner and a short service (in the church) for the celebration of the feast day of St. Nicholas of Myra. 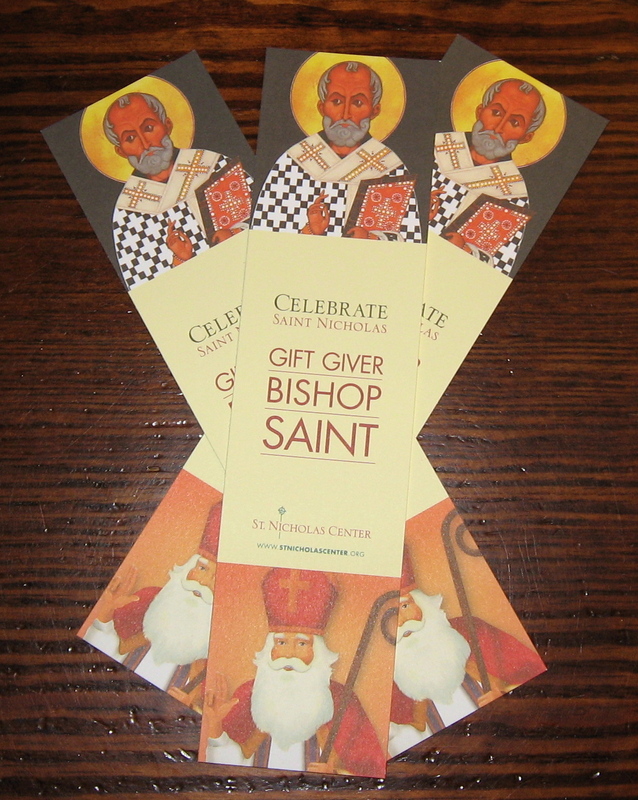 A parishioner is set to dress as the good bishop. We’ll have candy canes to bless and pass out. And,, any child who leaves his shoes in the hallway outside the church will perhaps find that St. Nicholas has left an orange and some chocolate coins and a bookmark from the St. Nicholas Center during the service. It’s a bit scary – and fun – to change things around. 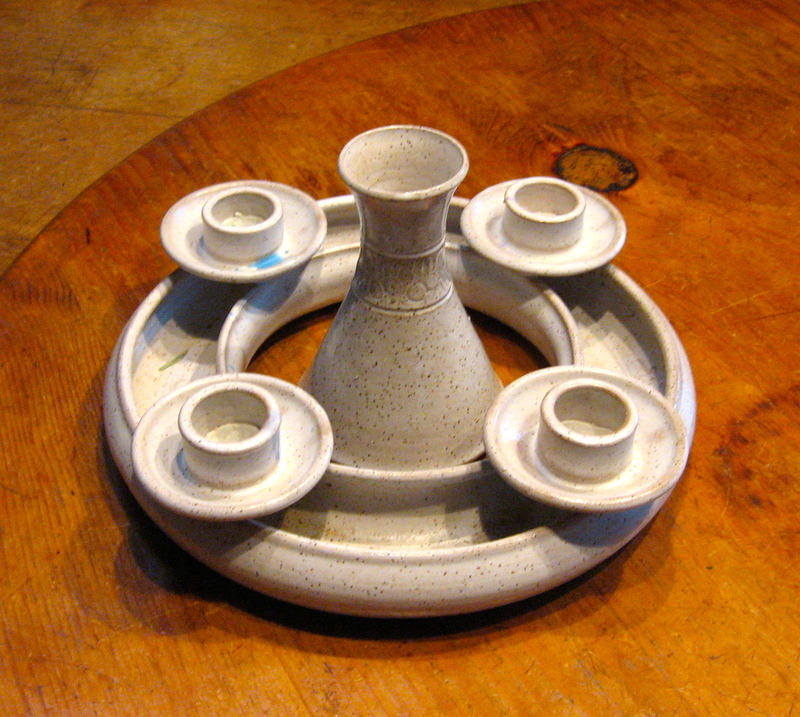 When my children were small, most of us used an advent wreath made by a local potter that we used with evergreens, so we never considered a wreath-making event. 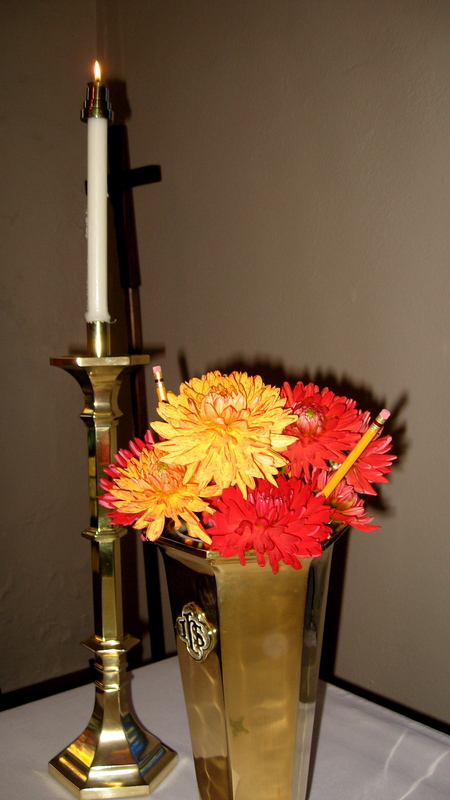 And while we don’t use children’s sermons quite like this, I highly recommend checking out my dear friend Fran’s blog on the chancel steps for her series of RCL lectionary-based children’s sermons for Advent and Christmas Eve/Day. I think they’re great! I am including them in the booklet “Celebrating Advent in the Home” that we’ll hand out at the Wreath Making Workshop on December 2, 2012. We all know I struggle with managing the response time. On Sunday, October 21, our talented storyteller told the story of Job from Vol. 6. It was a WONDERFUL wondering period; the five children compared the story of Job to Jesus’ telling his friends that they should follow Him. After such a lengthy wondering period and a short time of prayer, we left the children to their work time. As the doorkeeper, I thought carefully, and decided humor would work best. I’m not often right…but I tried. I explained that this part of the class was to give them time to think more deeply about the story in some way. I also said that there’s 168 hours in the week, which left them 167 hours to draw bunny mazes, but I had only 1 hour to encourage them to think about Job. And so I left them. 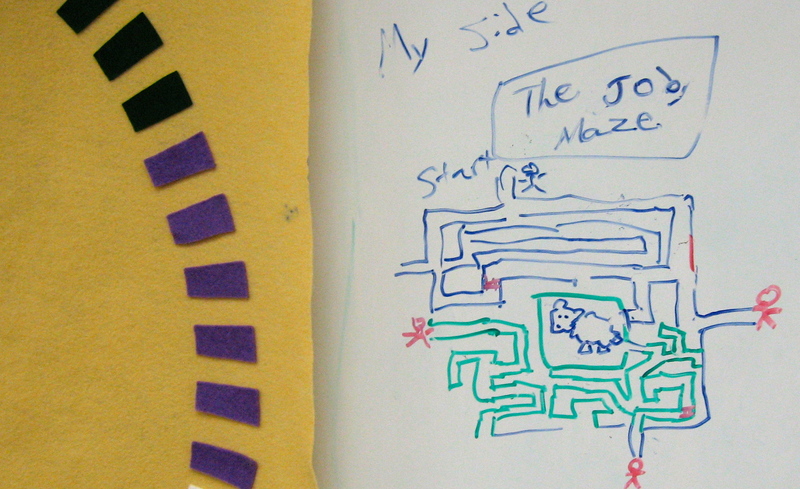 At the end of class, they proudly showed me their “Job Maze.” Sheep figured as the center “prize” of the maze; the “danger zones” around the edges featured “Job’s angry friends.” They pointed out their well-thought-out maze, and wondered if I would get after them for finding a loophole. Nope. That loophole worked fine for me! When I reported here on our first go at doing a Stations of the Cross for our Godly Play children (ages 4 through 5th grade), several people asked me where they could find the “script” that she used. I have the highest respect for copyrighted material, and if this is for sale somewhere and I am violating your rights of ownership, please contact me immediately so that I can remove this post. My intent is not to violate copyright but to share God’s love with this beautifully crafted script. It was a very powerful activity with our children and adults who participated. I spent some time doing internet searches and inquiring, but I haven’t been able to unearth any information on the authors. 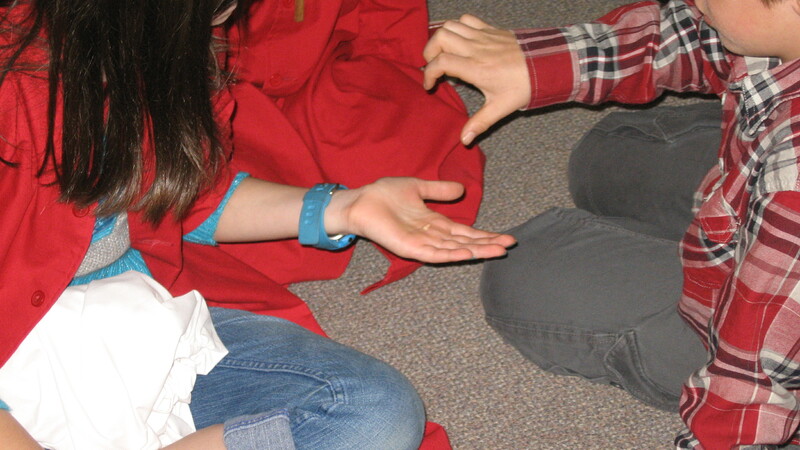 Here is the version we used: Stations of the Cross for Children.